All gates can interact with each other. You work your way from "Gate 1:The Refocus Technique " to "Gate 8:Mental Toughness " by accumulating and applying correct tennis knowledge incorporated in the sphere. You move out of the Mental Toughness Sphere by allowing your emotions to control your thinking. You can also tap other sources of knowledge, including coaching, trial and error, books, tapes or a combination of all four. Because trial and error takes time, you can shorten the learning curve tremendously through good coaching ,books or tapes. 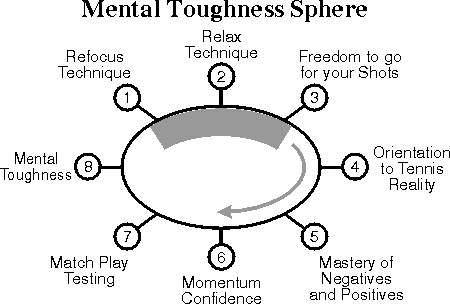 The Mental Toughness Sphere incorporates an abundance of mental techniques and tennis knowledge.